Vice President, M. Venkaiah Naidu addressing the gathering after laying foundation stone for Kartarpur Corridor, in Gurdaspur, Punjab on November 26, 2018. The Governor of Punjab & the Administrator of Chandigarh, V.P. Singh Badnore, the Union Minister for Road Transport & Highways, Shipping and Water Resources, River Development & Ganga Rejuvenation, Nitin Gadkari, the Union Minister for Food Processing Industries, Harsimrat Kaur Badal, the Chief Minister of Punjab, Captain Amarinder Singh, the Minister of State for Housing and Urban Affairs (I/C), Hardeep Singh Puri, the Minister of State for Social Justice & Empowerment, Vijay Sampla and other dignitaries are also seen. 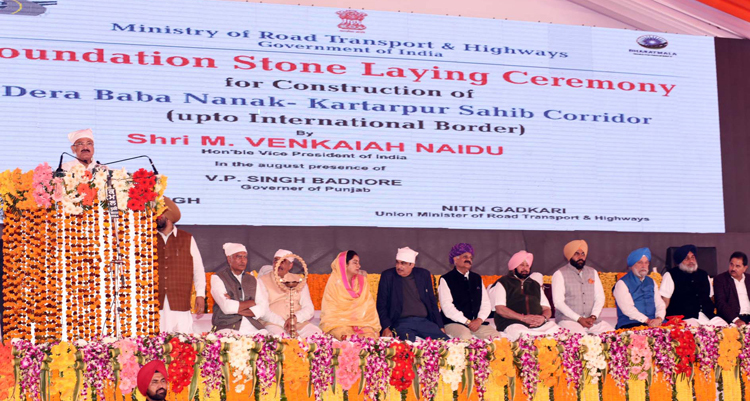 Vice President Venkiah Naidu laid the foundation stone for the Kartarpur Corridor on the Indian side on November 26 and Prime Minister Imran Khan on Pakistani side on November 28. But concurrent to the latter, Pakistan delivered a blow to India, with the 'Sikhs For Justice' (SFJ) announcing that a Kartarpur Convention will be held in Pakistan during November 2019; for self determination by Sikhs, a separate nation for Sikhs, and liberating Punjab from India (https://m.youtube.com/watch?v=i60q72SArWg&feature=youtu.be). 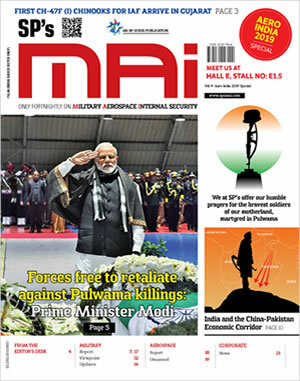 The earlier assertion by Pakistan they will eventually revive militancy in Punjab is coming true – thanks to India's lack of strategic sense, foreign policy failure and lack of appreciation on part of the PMO, NSA, MEA and MHA of ISI's long-term plans. It would be na�ve to think that Pakistan will not permit Kartarpur Convention 2019 announced by the SFJ. Reviving militancy in Punjab has been the effort of the ISI since long, of which flooding narcotics into Punjab was the prelude. Prime Minister Narendra Modi appears to have been influenced by the discredited Akali Dal in Punjab, his unofficial number two – FM Arun Jaitley, and principal political parties of J&K ganging up with the Congress, forcing dissolution of J&K State Assembly. Modi comparing Kartarpur Corridor with fall of the Berlin Wall maybe have been a political statement but he apparently wasn't briefed why Pakistan had made this proposal at this juncture, what were existing enablers in Punjab and what the future consequences would be. Those who believe that the Khalistani movement will affect Pakistan also, should know that the Hindu-Sikh population has reduced in Pakistan from 24% post Partition to just 2% today. And, it is reducing further through forced conversions, rapes and forced marriages. There have been cases of Sikhs being targeted and killed also. Three Sikhs were among 31 killed and more than 40 injured in a powerful blast in Khyber Pakhtunkhwa, Pakistan on November 23, 2018. The Khalistani movement will therefore affect India, not Pakistan which is already supporting 'Referendum 2020', and harbouring and training Sikh militants. Sikh pilgrimage routes and gurudwaras in Pakistan display hoardings of 'Referendum 2020', Khalistani flags and photographs of Sikh militants. Inviting select Indian cricketers to Imran Khan's swearing in ceremony was no innocent exercise. The ISI would have appreciated that while other would refuse, Navjot Singh Sidhu will come running. The spectacle of Sidhu publicly touching the feet of the former Congress President unmindful of the sniggers this would invite at the cost of his reputation as a cricketer was seen by all. This established his political ambitions above everything else. The ISI would have also known that Sidhu's obeisance was actually a gesture of thanks in saving him from culpable homicide charge with an unbelievable low fine of 1000 only. Sidhu became Pakistani army chief Qamar Javed Bajwa's blue-eyed during Imran's swearing in. Bajwa conveyed the suggestion of opening Kartarpur Corridor through him. Bajwa would have also promised Sidhu help in alleviating his political career, which would have gladdened Sidhu with Punjab CM Amarinder Singh indicating he is not interested in another term. According to a R&AW veteran, ISI allegedly paid 13000 to an Indian politician to help revive Sikh militancy in Punjab. Appreciating the saleability of Sidhu and being a minister in the Punjab Government, he was another ideal target for the ISI. CM Amarinder Singh refused Pakistani invitation to attend the foundation laying ceremony of Kartarpur Corridor because of Pakistan's continuing terrorism, our soldiers being killed and ISI activities in Punjab. But Sidhu had no such scruples. Amarinder did ask Sidhu to reconsider his decision to go to Pakistan again, but obviously could not stop him from going because of the Congress High Command. It is no secret that in the past Congress deputed individuals like Mani Shankar Aiyer to go to Pakistan and beg assistance for getting back to power, in addition to organizing meetings with Pakistanis in India too. In declining Pakistan's invitation, Amarinder Singh wrote that "since his government came to power in Punjab, the state had neutralized 19 ISI armed and controlled modules, apprehended 81 terrorists and recovered 79 weapons, in addition to numerous grenades made in Pakistan's ordnance factories, with Austrian knowhow, along with seizure of some IEDs". This alongwith Pakistan's increased hostilities along the LoC and IB should have been enough to tell Pakistan their suggestion for the Kartarpur Corridor will be considered when Pakistan stops terrorism against India. Besides, who in his right mind thinks that Pakistan will make peace with India given past 70 years history, and when existence of Pakistan is based on anti-India bias? Sidhu appears to have become ISI's spokesperson. He says religion should be kept separate from terror and politics, conveniently ignoring that confluence of these three elements is what constitutes the policy of Pakistan. Grant the ISI a well thought move of the Kartarpur Corridor, linked with 'Referendum 2020' preceded by the 'Kartarpur Convention 2019, capitalizing on our political infirmities and pressures of election environment. Ironically, the dye is already cast for the Kartarpur Corridor. This corridor will see steady flow of visitors through the year. Our pilgrims streaming into Pakistan may include unscrupulous individuals and some susceptible to brainwashing and separatist propaganda, which the ISI will subject them to, possibly in conjunction Chinese advisors. The pilgrims could also include smugglers and politicians that may be saleable, putting self and mafia/party interests over the nation. A converse flow from Pakistan to India should also be expected, facilitating inflow of radicals, preachers and terrorists under pretext of visiting religious places in India. We may say our security forces are enough to keep the situation 'under control'. But, unemployment, narcotics, diminishing agriculture incomes are enough to induce terrorism, especially if religious fervor is induced to fuel separatism. Militancy in Punjab will affect neighbouring states as also our economy. This is going to be one of our biggest security challenges.